Alzheimer's Challenges Notions Of Memory And Identity : 13.7: Cosmos And Culture As those with Alzheimer's disease lose their memories, do they also lose their identities? Commentator Tania Lombrozo considers new research into traits seen as central to identity. Last week, comedian, actor and activist Seth Rogen testified before Congress about the importance of research on Alzheimer's disease, highlighting the emotional and financial burden the disease places on families — like his own — whose loved ones are affected. He noted that Alzheimer's often begins with an assault on relatively inconsequential memories, such as the location of keys, but eventually becomes much, much more. In both of these cases, the disease seemed to threaten the person's "true" or original self. As memory declined, so did the individual's identity. Yet this perception rests on two assumptions: one about the way we track people's identities over time, and the other about the way Alzheimer's affects the human mind. Each of these has been the subject of empirical research, and the findings may offer a rare bit of positive news when it comes to the disease. First, how do we perceive an individual's identity over time? Within philosophy, theories of personal identity often rely on memory as a basis for identity. According to a view sometimes attributed to Locke, for example, what makes you the same person now as in the past is precisely the continuity in your memories — an aspect of the mind with which Alzheimer's wreaks havoc. So it's surprising, then, that a new paper by Nina Strohminger and Shaun Nichols, published in the journal Cognition, suggests that memory may not be all that special when it comes to the way we think about others' persistence over time. Participants were asked to imagine they were meeting an old friend they had known when they were 25, and whom they had not seen in 40 years. Subjects were presented with a list of changes the friend had undergone, and instructed to indicate the degree to which each change would impact the friend's identity. The response to each item was given on a scale from 0% ('This change has no impact on his true self') to 100% ('This change completely alters his true self'). Subjects were asked to assume that for each trait listed, the friend was not that way when they had known him last. The changes that people were asked to evaluate involved a range of psychological characteristics. 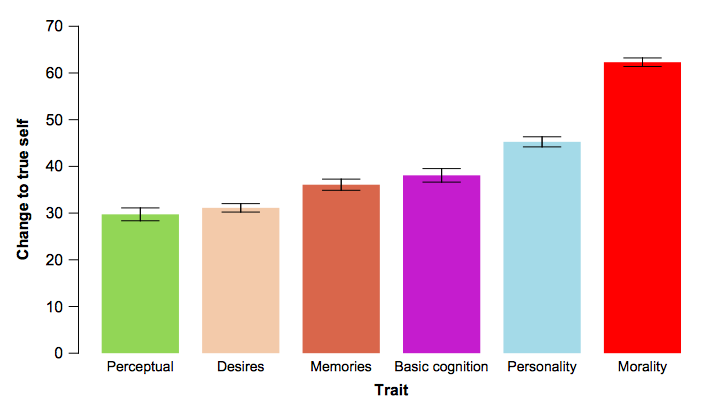 Some related to memory (e.g., being forgetful, bad at remembering new information, forgetting childhood memories or how to ride a bike), some to personality (e.g., adventurous, artistic), some to desires and preferences (e.g., hates exercise, likes talk radio), some to cognition and perception (e.g., worse attention span, moderate hearing loss), and some to moral beliefs and moral character (e.g., racist, selfish, generous). The startling result was that memory wasn't a front-runner when it came to what sustains someone's "true self." Instead, the winner was morality. A person who had trouble learning new information or forgot childhood memories, for example, was regarded as less fundamentally altered than one who became cruel or selfish, or even one who acquired positive moral traits, such as honesty or forgiveness. These findings suggest that folk notions of personal identity are largely informed by the mental faculties affecting social relationships, with a particularly keen focus on moral traits. This research reveals something important about the perception of identity in the face of decline. But what about the nature of the decline itself? As people with Alzheimer's disease lose their memories, is their social and moral judgment similarly compromised? For more than a decade, psychologist Deborah Zaitchik and her colleagues have been studying the patterns of cognitive impairments that characterize Alzheimer's disease. Their findings show that some of the mental faculties most critical to social relationships — in particular, the ability to infer other people's beliefs and desires and to engage in moral evaluation — are actually among the least impaired. As one example, Zaitchik and colleagues have found that many patients diagnosed with Alzheimer's make judgments in the domain of biology that mirror those of preschool-aged children. They'll claim that the sun is alive, and that a raccoon that's been coifed to look like a skunk, with a surgically implanted "sac of super smelly odor," is truly a skunk, not a (curiously abused) raccoon. Yet the very same patients who fail to recognize the preservation of species identity in the face of such superficial interventions can accurately track a person's false beliefs in the face of changes that affect the truth of those beliefs, another ability that develops in the preschool years. So while "folk biological" understanding is deeply impaired, basic "theory of mind" appears to be spared. In another study, Alzheimer's patients were no worse than healthy elderly participants when it came to judging whether someone who failed to make a commitment did something wrong, a basic moral evaluation. Sadly, these findings don't take us any closer to prevention or a cure for this devastating disease. But perhaps there's some small comfort in knowing that many of the traits we value most in tracing an individual's "true" identity, and that matter most in maintaining social relationships, are among the most robust to the disease. 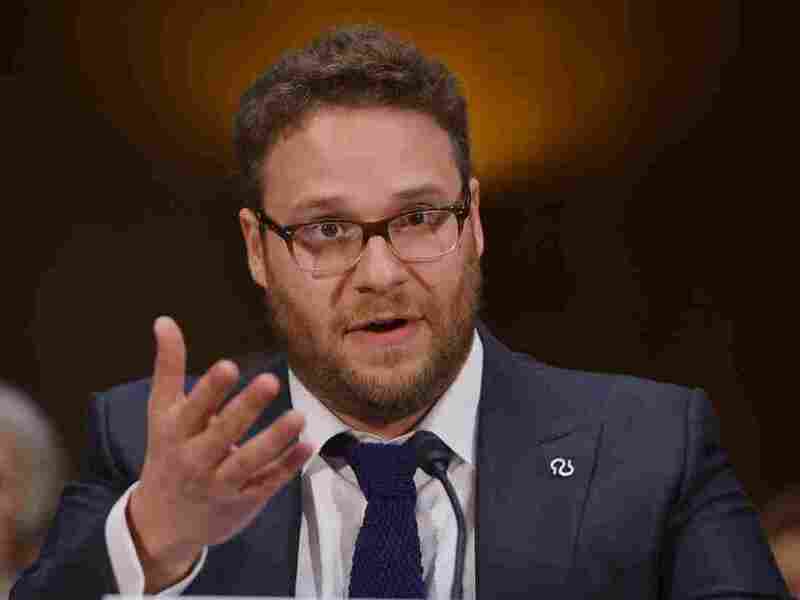 And if we do want to speed along prevention and a cure, and to help those already suffering, we can join Rogen in his call for greater support for Alzheimer's research, increased awareness, and more widespread medical and financial resources.